*This blog and any posts related to the Razoo fundraising widget I’m promoting to raise funds for Girl Up are my own, and not on behalf of my employer. However, the funds raised WILL support that campaign, which I work for. It’s that time of year: the Christmas shopping commercials, the inundation of emails asking us to give online or to visit the eStore to purchase holiday gifts from Nonprofit X or Retailer Y. And yes, I’m putting out an ask as well, but hey, it’s what I do – I work in the world of online communications and fundraising. I wrote before about supporting the campaign I work for, Girl Up, through a new online fundraising widget from Razoo, and we’re having a friendly competition between some of the ZooGooders over the next week in the spirit of the holiday giving season. So, with that in mind, here’s the thing: new fuzzy socks or a DVD are fun stocking stuffers, and it’s nice to watch someone open a new Wii or a beautiful coat, but what about how you feel inside when you give the gift of an education to a girl? What about what the girl feels when she is given the opportunity to attend school, to have a chance at life? 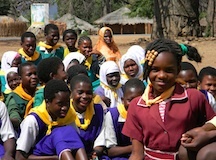 That’s what thousands of girls in Malawi need – a chance. They need to go to school, they need a health care clinic to visit, they need programs in their communities that provide safe spaces and mentors and life skills. So I’m asking you to forget the trip to Target, skip the Amazon deal, and instead, give a High Five or more to Girl Up – right now. And then, ask your best friend and your niece and your mom, and your grandma and your uncle, and your teacher, and your neighbor to give as well. Because every $5 can change a girl’s life – and the effect will be much more lasting and significant than socks or a DVD. Give a High Five right now to Girl Up and change a girl’s life.